Editor Charles H. Smith's Note: Forbes's Polarity theory is little remembered today, except insofar as it produced the incentive for Alfred Russel Wallace to write and publish his first important work on biogeographical method (the so-called "Sarawak Law" paper) the next year. Original pagination indicated within double brackets. Citation: Notices of the Proceedings of the Meetings of the Members of the Royal Institution 1 (1854): 428-433. [[p. 428]] Of the four relations among organized beings, viz: Affinity (or relation through homology), Analogy, Representation, and Polarity, the three first have been recognized in the distribution of beings in Geological Time; the fourth has neither been observed nor sought for. The term itself is one not familiar in the language of Natural History, although proposed many years ago by the Swedish botanist Fries, and systematically employed by several naturalists for some time past. The word Polarity seems objectionable, since it has been appropriated with a peculiar signification by Physical philosophers. The sense in which it is employed by Naturalists, that of a manifestation of force of development at opposite poles of an ideal sphere, cannot however be indicated by any other word at present invented, implying as it does something very different from divergence and from antagonism, words which have been suggested as substitutes. 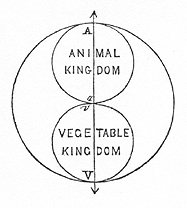 The ordinary illustration of the relation of Polarity, in a natural history sense, is that representing the relation of opposition or progression in opposite directions of the Animal and Vegetable series; the meeting point of both being at the points of lowest development of each (a, v, in the accompanying diagram), where the animal and vegetable natures are almost confounded, whilst the strongest manifestations of each are at A and V, the highest animals being farthest removed from the highest vegetables,--in other words, at opposite poles of the sphere of organized beings. The earnest desire implanted instinctively in every enquiring mind, to discover a law or scheme in arrangements of Nature, has given origin to many speculations concerning the distribution of life in geological time, all of them founded on facts more or less clearly [[p. 429]] understood. Hence have arisen the hypothesis of an evolution of all organized types, during the course of time, from one rudimentary prototype; that of the succession of distinctly originating forms of animals and vegetables in order of the progression within their respective series; of the coeval starting of the great groups wholly or mostly at the beginning, but in each instance by the lower forms of the type; of the representation by the faunas and floras of geological epochs, of the successive zones of life belting the geographical regions between the poles and the equator; of an uniformity of life arrangements throughout time and repetition through substitution of equal and similar groups; and of manifestations in the distribution of life in time of analogies that are essentially theological. For several years I have been persuaded that the simple and unquestionable phenomena of substitution of groups by representative groups, manifested in the arrangements of the faunas and floras of all geological epochs, and comparable with like phenomena exhibited by the geographical distribution of existing organized beings, would prove sufficient for the explanation of all the appearances, that have suggested such speculations, some purely hypothetical, some fairly theoretical, as those I have just indicated. The apparent contradictions and unexplained peculiarities presented by the more ancient epochs as contrasted with the middle and newer ones, seemed to depend on the incomplete state of our knowledge, and to be possibly explainable by supposing, that of some great geological epochs in time we had as yet discovered no traces. Thus the great gap between the Palæozoic and Mesozoic life might depend upon our not yet having discovered traces of the rudimentary formations that had been deposited during the interval between the Permian and Triassic epochs. But the rapid accumulation of palæontological facts gathered within the last very few years, and the great additions that have been recently made towards our knowledge of the Palæozoic fauna, all mainly in accordance with facts known before, have satisfied me that the explanation offered above does not sufficiently meet the full truth, and that the various theories concerning progression, development, &c. have all originated in the obscure perception and imperfect interpretation of the workings of some great law in the distribution of organic beings in time. It is no longer possible, in the face of palæontological evidence, to hold any of the notions cited. The scale of the first appearance of groups of beings of any degree is most clearly not one of organic progression. Suitable conditions have been met by the creation of suitable types; no type, whether generic and therefore ideally manifested, or specific and therefore manifested actually and through individuals, visibly, being found to be ever repeated in time, when the full history of either is made out. This is a great law and a grand result of geological research. Nevertheless in the relative arrangements, so to speak, of generic types in time, there is an [[p. 430]] indication of the working of a general law of another kind, and one, which seems to me to depend on the manifestation of the relation of Polarity. We are accustomed to group all geological epochs under three great sections, the Palæozoic, or oldest, the Mesozoic or middle, and Cainozoic, more commonly termed Tertiary, or newest. If we consider the faunas (and floras) of these three great sections, we cannot but perceive that there is a far stronger affinity between the Mesozoic and Tertiary epochs than between the Mesozoic and Palæozoic. This is especially manifest when we regard the details of the distribution of those preservable forms of animal life, which being inhabitants of the medium in which sedimentary strata are deposited, are most likely to afford an approach towards complete evidence. On the other hand, the forms of life that characterize the Palæozoic formations, the products of a vast succession of time-periods, have, when regarded in their totality, a wonderful agreement and relationship among themselves. For this reason I propose to denominate the sum of the epochs after the Palæozoic, by the name of Neozoic. Now if we regard these two great periods separately, we find that the manifestation of generic types during each exhibits striking and contrasting phenomena. The maximum development of generic types during the Palæozoic period was during its earlier epochs; that during the Neozoic period towards its later epochs. 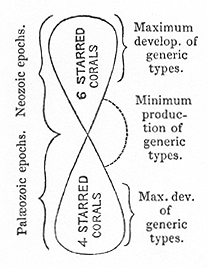 And thus, during the Palæozoic period, the sum of generic types and concentration of characteristic forms is to be observed in Silurian and Devonian formations; during the Neozoic period it is during the Cretaceous, Tertiary, and present (itself part of the Tertiary) epochs that we find the maximum development of peculiar generic types (or ideas). On the other hand, during the closing epochs of the Palæozoic and the commencing epoch of the Neozoic period there was a poverty in the production of generic ideas, with few exceptions the species of the epochs in question being members of genera that form constituents in the assemblage, accumulated during the epochs of maximum of generic types or ideas. Before the Silurian and after the commencement of the present, no special creations of generic types have as yet been shewn to be manifested. In the system of life of which all known creatures [[p. 431]] living or extinct as yet described, so far as our knowledge extends--and there is a consistency in its co-ordination that suggests the probability of our being acquainted with its extremes,--the creation of the fauna and flora of the oldest Palæozoic epoch would seem to be the primordial and the appearance of man the closing biological events. When the assemblage of characteristic Neozoic groups or genera is contrasted with that of the Palæozoic, there we find that the concentration of a maximum development of generic types towards the earlier stages of the one and the later of the other great period, includes something more than a mere numerical profusion of generic ideas. The two great manifestations of creative intensity are in opposition, or contrast, and respectively substitute each other; groups that are parallel within their sub-kingdoms or classes taking the place of each other and playing a corresponding part in the economy of nature. This replacement does not depend on the substitution of a group of higher organization during the latter epoch, for one of lower during the former. Where there is such a substitution it must be regarded as an accident; for the rule is not general nor can it be held good except for a few instances. A few leading examples of the substitution of group for group during the contrasting epochs are cited in the following table and will illustrate this point better than a mere abstract statement. If we were to shew by means of a detailed diagram the relations in each of these groups of the development of generic types to time, we should symbolise it by a cone or a pyramid, the base or fullest portion of which should be turned respectively towards the commencement of the Palæozoic, or termination of the Neozoic epoch. The last example given will shew this strikingly, though in most instances the groups interlace. Relations of this kind may be manifested in a low degree, even within the range of a single group. [[p. 432]] From all these considerations, the numbers of species in a group or genus at any given epoch is to be excluded, not being an element in the discussion of the question, though apt to be introduced through mistake of the nature of the generalization attempted to be attained. There may appear to be a contradiction involved in the expression manifestation of polarity in time, for since time implies sequence or progression in one direction only, how can we connect with time an arrangement that involves the notion of progression in opposite directions, proceeding from a median zero? But time is an attribute with which man's mind invests creation; a mode of regarding Divine ideas, necessary for the conception of time by our limited faculties and forming in itself no part or essence of the Divine scheme of organized nature. We speak of Polarity in Time, for want of a better phrase: but this polarity, or arrangement in opposite directions with a development of intensity towards the extremes of each, is itself, if I am right in my speculations, an attribute or regulating law of the divinely originating scheme of creation, therefore strictly speaking independent of the notion of time, though perceptible by our minds only in connection with it. 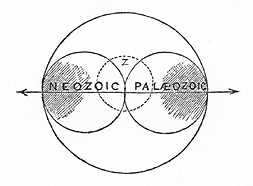 By a diagram such as the above we may fairly express this view, the shaded portions of the circles included within the great circle of the system of nature representing the maxima of development of generic ideas, and the dotted area, z, the region of their minimum productions. In venturing on a speculation of this kind I am aware that it is subject to much misrepresentation and liable to be misunderstood; the more so since the suggestion must precede the demonstration. At present it can scarcely be received as more than a suggestion; one put forth as worthy of consideration. But in issuing it I do so keeping in view a vast number of individual facts and base it upon the results of investigations of no small extent. To lay these before the scientific world in detailed and tabulated shape will be the work of more leisure than can at present be given to the task. In the hope of acquiring fresh data for this investigation I, rashly as some may think, make public this hypothesis. That it is the only [[p. 433]] one of its class which holds out a prospect of eliminating the germs of truth contained in the conflicting theories at present more or less in vogue, and the only one with which the presence of species of any group of organized beings at any geological epoch will not disagree, are surely considerations that should secure for it a friendly reception. If it be as true, as I believe it to be, then the truth that it contains is most important; if it prove in the end to be a misinterpretation, it will at least have served the good purpose of stimulating inquiry in a fresh direction.